Steel, sapphire dial and slimmer. Montblanc has just announced a new iteration of the Heritage Chronométrie Perpetual Calendar Sapphire, the competitively priced perpetual calendar that caused a stir when it was first launched in 2014 because it was surprisingly affordable. It’s now slimmer, jazzed up but just as accessibly priced. The case remains steel, having been refined with slimmer, more tapered lugs. It measures 40mm in diameter and 9.6mm in height – 0.7mm thinner than the original. But the biggest upgrade is the smoked sapphire dial, originally available only on the 18k gold version, which shows off the gears, cams and levers of the calendar mechanism. 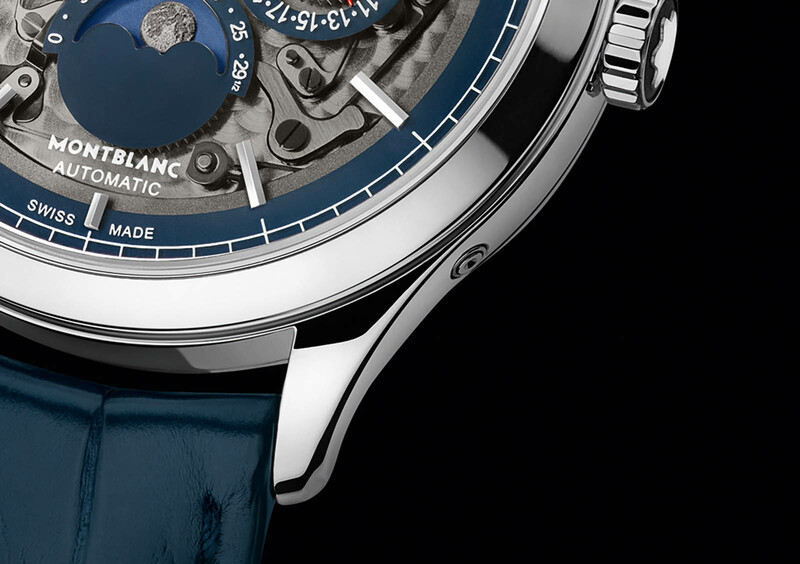 The sapphire dial has been given cleaner, more contemporary styling than the one on the gold model, with rhodium-plated, faceted baton indices and an Arabic “12”. The calendar indications are displayed on transparent counters with dark blue tracks, matching the flange. And the moon phase has also been refined with a realistic, three-dimensional depiction of the moon. Like all perpetual calendars, the watch shows the time, the day, the month, the date, and the phase of the moon, with no need for correction until the year 2100. The calendar is easily adjusted by individual correctors on the side of the case. Powering the watch is the automatic MB 29.15, the same calibre found in other versions of the watch. It’s based on the trusty Sellita SW300, fitted with a Dubois Depraz module on top, which is exactly what’s seen through the sapphire dial. 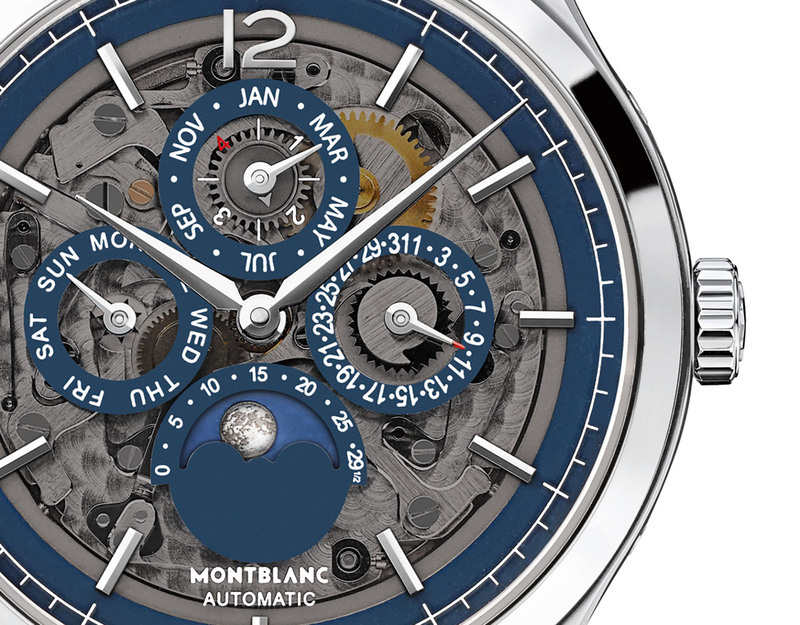 The Montblanc Heritage Chronométrie Perpetual Calendar Sapphire (ref. 118513) is priced at €12,500, or S$19,900. That’ equivalent to about US$14,760. A tinted sapphire dial showing off the movement. For a detailed explanation of the watch, click here. 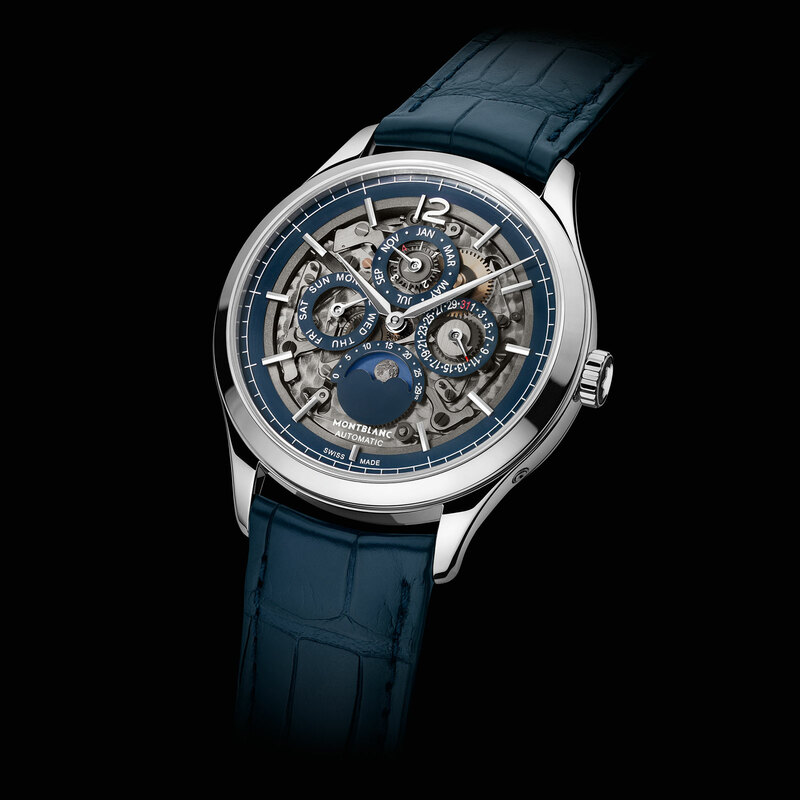 The second generation of its signature perpetual, now with the calibre 36 that boasts a 100-hour power reserve.